They don’t call him the King for nothing. He looms large in the net and it takes a lot to rattle him. His commercial shows him facing off against a charging black Rhino that shatters upon impact. He’s got moves and skills but is he any match for The Amazing Geno-Man? 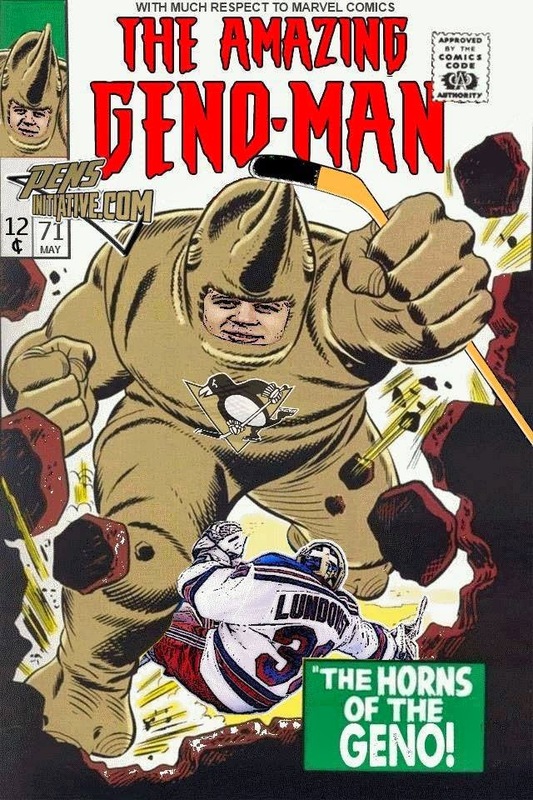 The Geno-Man is a hockey phenom. He glides across the ice with the speed of a Grey Hound and the smoothness of Crosby’s face. His durability has taken a hit of late but with the proper intake of Mamma Malkin’s Borscht he can move at high velocities over short distances, survive extreme heat and unleash a slapper that’ll rip thru the back of the net. His superpowers are enhanced when he’s got his right wing man, “Lazy” by his side. His ‘Bromance” with Lazy inspires Geno-Man’s playful side which in turn inspires him to maniacal heights. Geno-Man charges his opponent with the fierceness of a rhino and will be looking to dethrone the King. Beware! In addition to big horns Geno-Man has a quick temper . He has been known to let his stick get out of control when pushed to ager resulting in deployment of the PK unit to bail him out. Geno-Man possesses something referred to as "drama power", or basically a tendency for his powers to increase as the situation becomes more dramatic. Make him mad….he’ll score a goal. The King will deploy all of his Rangers to try to stop Geno-Man but he’s got a few deadly Penguins up his sleeves. Art and other brilliance by Ryan Noble, Rob Ullman and Brian Blystone.